AdvanceElite is an adware program that may inadvertently expose you to potential computer security threats. This application simply displays commercial advertisements on popular shopping websites, such as eBay, BestBuy or Amazon. Users often think that AdvanceElite ads are merely annoying, and that is it. However, that is definitely not the case. It is necessary to remove AdvanceElite from your computer if you want to avoid serious computer security issues. Even if this adware application does not intend to infect you with malware itself, it might as well become a pawn in a far wider circle of malware distribution. 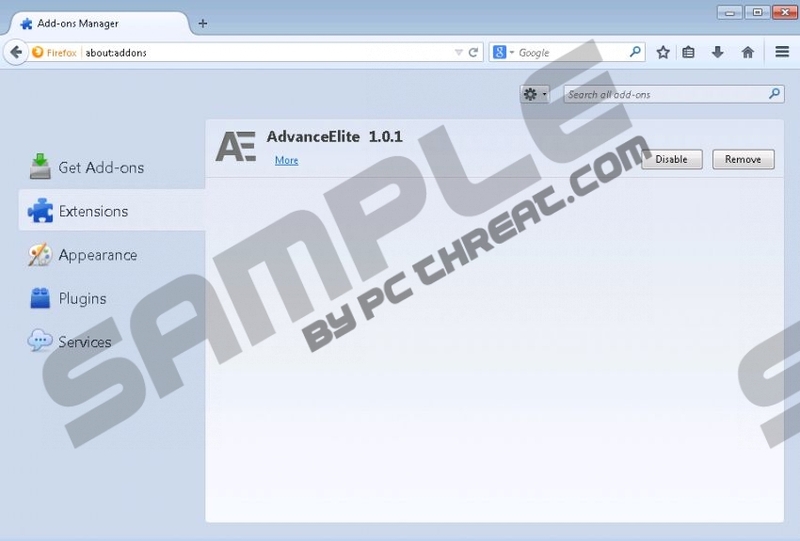 AdvanceElite belongs to a big group of adware applications. They are usually called SuperWeb adware because all of the applications are developed by SuperWeb LLC. Technically, programs from this group are identical, so we could say that AdvanceElite is a new clone of Rad Rater, Larparus, BetterEnhance, BrowsePro and many other potentially unwanted applications. The common feature of SuperWeb adware apps is their fake homepages. AdvanceElite also has an “official” website at advanceelite.com, but there is nothing good over there. It is impossible to download the application – clicking Start Now button simply brings you to a blank new tab. Where does AdvanceElite come from them? The answer is simple – bundled downloads. All SuperWeb adware applications get distributed bundled with freeware applications, and AdvanceElite is of no exception. Thus, it means that if you have this adware application on your PC, it is very likely that there are more unwanted programs installed. If your computer has been slower than the usual lately, and if you experience various disturbances when you browse the Internet, perhaps you should run a full system scan with a reliable antispyware tool – there is a great chance that you might be harboring a nest of adware applications on your system. Technically, there is nothing malicious AdvanceElite about, and the program simply displays commercial ads. Nevertheless, the program does not review what kind of content gets embedded into the ads, and so it may accidentally expose you to unreliable websites and even malware-related pages. You should refrain from clicking AdvanceElite ads. Open Control Panel and then uninstall AdvanceElite from your computer completely. If you need help, scan the PC with SpyHunter free scanner and the tool will indicate all the potential threats on board. Do not forget that you need to remove other unwanted applications as well (if any). We provide manual removal instructions below this article. Should you have any further questions about AdvanceElite or your computer security in general, you can always leave us a comment. Select Uninstall a program and remove AdvanceElite. Go to Uninstall program and remove AdvanceElite. Select Add or remove programs and uninstall AdvanceElite. Quick & tested solution for AdvanceElite removal.